Read 2 times. Last read March 25, 2019. 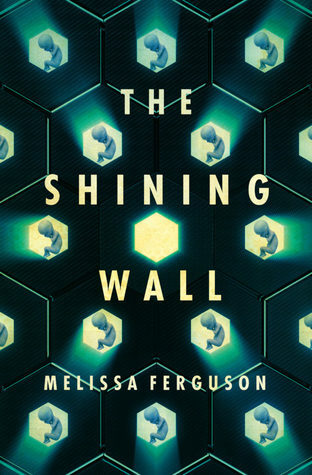 The blurb of The Shining Wall (Transit Lounge Publishing 2019) tells us that author Melissa Ferguson is ‘a cancer-fighting scientist who loves to explore scientific possibilities through fiction’, and in her debut novel about the dystopian society of a ruined world, she certainly combines her scientific knowledge with her creative imagination to create a world both frightening and apocalyptic. This is a story about power – the powerful and the powerless, the haves and the have nots. In a future age, advanced technology has allowed wealthy humans to build lives of privilege behind a shining wall, lives extended by many years and augmented with artificial intelligence and scientific discoveries. Implanted chips do everything from manage your funds via a credit system to diagnose and treat illness. Robot technology provides security. OmniScreens provide information, or IntelliEnhance systems are implanted directly into your brain. The organisation LeaderCorp keeps tight control of City 1. But outside the city walls, life in the Demi-Settlements is very different as poverty and disease force people to live in slums, scavenge for food and essential supplies, and avoid the ever-present Security Forces. The cloned Neoandertal officers are literally a different breed, there to service the Sapiens. And the Rewilders roam like mercenary hippies, hoping to prevent the technology taking over. In the midst of this dramatic and terrifying new world order, we meet our main characters. Alida (17) and her sister Graycie (5) are orphaned on the first page, left to fend for themselves in a society that has no place for weakness. Alida is desperate not to resort to selling her body like so many others, or worse, being used as an incubator to birth children for those in City 1. But there are even worse fates, such as being harvested for your organs or designated for the medical research facility. Alida is a kick-arse character who travels these pages with wit and humour, with love and devotion for her sister, loyalty to her friends and an innate sense of survival. Shuqba is a cloned Neo with a heightened moral compass. When she is sent to a remote outposting in the Demi-Settlements, she finds herself unable to align her strict orders with the feelings she develops for those she has been sent to protect. Women are the silent strength in this novel: fatal viruses and wounds that won’t heal, end-of-days survivalist strategies, a complete upheaval of what is valued, power struggles between various factions – through everything, the women and girls protect each other, make sacrifices, make terrible choices in order to survive, and use their ingenuity and their emotions to outwit their enemies. The structure of the world-building and the attention to the details of the minutiae of everyday life keep this book interesting, but it is the relationships between the characters that evoke care and uncertainty as to their fates. This book is a mixture of The Road to Winter by Mark Smith versus Watershed by Jane Abbott versus The Handmaid’s Tale by Margaret Atwood: a frightening vision of a possible future; a frantic game of survival; an emotional tale of connection. Sign into Goodreads to see if any of your friends have read The Shining Wall.